Hello and welcome to my Hankook Kinergy GT H436 review. Most vehicle owners today want a tire that will provide great traction in almost every condition, quiet and comfortable ride, and long tread life. This is a tall order that’s not easily achieved – even some premium manufacturers struggle to incorporate everything into one product. Tires that are closest to what the average buyer looks for in a tire are grand-touring tires. These tires are made for long highway driving. They are mostly used on sedans, but you can find them installed on crossovers as well. The thing with grand-touring tires is that they last for a very long time and that they are very quiet and comfortable. The best models also offer good traction in dry and wet conditions, but in this area, they’re simply not at the level of high-performance tires. As a matter of fact, this is one of the worse aspects of a grand-touring tire and that’s why it’s always the best to find the highest quality ones. Hankook is not a manufacturer that often comes to mind when talking about the highest quality products, but they’re still competitive in the budget segment. 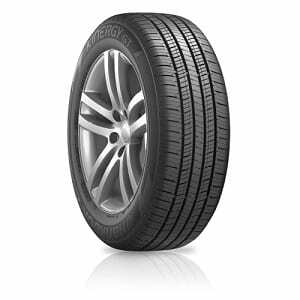 Their competitor in the grand-touring category is the Kinergy GT, a tire that first and foremost promises great comfort and long-lasting performance. 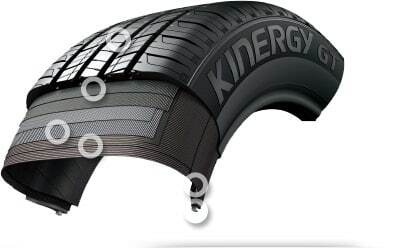 Interestingly, the Kinergy GT comes as Original Equipment tire in vehicles from Honda, Volkswagen, Hyundai, and Kia, which is not something you’d expect in other budget products. Hankook tried to incorporate everything an average driver would want in their sedans. Quietness and comfort are highest on the list, followed by long tread life and traction in all types of weather, including light snow. To achieve all of this, the Kinergy GT is molded of the silica-infused all-season compound. The tread design is symmetric, divided into a five-rib pattern. Of those ribs, the center one is the most rigid and aids traction for acceleration and braking performance, while the high-modulus bead filler increases sidewall stiffness and helps the tire provide the driver with more precise and responsive steering. For wet traction, there is the high-grip silica tread compound, while for water evacuation in heavy rain there are the wide lateral notches and four circumferential grooves. Snow traction is covered with multiple tread sipes with chamfered edges. The Kinergy GT is also made to be very strong and durable with two incorporated wide steel belts and a full-width nylon reinforcement. Other than improving durability, these features help with better handling and high-speed stability. The most important aspect of the Kinergy GT, comfort and quietness, is covered with jointless bead and a body casing made from polyester cord. All in all, it seems that Hankook incorporated everything it has in its arsenal in this tire. How all of that shows in real life? Read on down below to find out. One of the main reasons to buy this tire is durability and long tread life. When compared to other budget tires, the Hankook Kinergy GT holds itself very well – it’s easily one of the most durable grand-touring tires. The warranty is 70,000-mile tread life, which is very impressive for the price – competitors offer 60,000-mile tread life warranty. The Kinergy GT is also very good when compared to premium tires, but I wouldn’t go as far a to say that it’s the most durable tire of them all. As a matter of fact, it can show accelerated degradation if you drive your vehicle faster, so keep that in mind if your sedan has a bit more powerful engine, such as V6 or some turbocharged four-cylinder. High-speed driving and open roads shouldn’t pose a big problem though. If you set your expectations right, the Kinergy GT will serve you very well. Most drivers will never put this tire to its maximum capabilities in the corners, and traction while accelerating or braking is very good. If you want a tire that will be safe for you and your family, this one should be close on your list. That said, if you’re a more aggressive driver, the Kinergy GT is certainly not for you. It not only lacks precision and road feel, but the grip is limited if you enter a corner with higher speed. Some premium grand-touring tires offer better handling and more grip in the corners, but for real sporty driving, you’ll still need a high-performance tire. In wet conditions, the Kinergy GT is pretty good. It resists hydroplaning in heavy rain and feels secure in light rain, without losing traction. Sure, you can provoke it by entering the corner at a much higher speed, but for general driving, you should be fine. Braking is excellent – in my testing, the Kinergy GT stopped like the best grand-touring tires out there. Hankook promises light snow traction here, but to be honest, the Kinergy GT is not the first product that comes to mind for snow driving. Sure, it can tackle light snow, but only if you drive very slowly and carefully. Use it only if you confront sudden snow with your vehicle, but not if you live in areas with harsh winters. In those conditions, we recommend using a proper winter tire, or some advanced all-weather tire. If you are still reading this, you’re most probably interested in this section. So, is the Kinergy GT quiet and comfortable? Yes, it is. I’ll be straightforward – almost every Hankook tire I’ve tested is very quiet, at lower and higher speeds. This one is probably the quietest, which makes it a great companion to any family sedan. It’s also very comfortable on bumpy roads, improving the ride on almost every car. While I can certainly find some fault with the Hankook Kinergy GT, namely in the handling department and snow traction, I think that it’s a great choice for the average sedan owner. It is exceptionally quiet, offers smooth ride, long tread life, and good traction in wet and dry conditions. Not a stellar tire, but certainly a very good one. Thanks for reading and I hope you found this Hankook Kinergy GT H436 review helpful. If you have any questions or comments please feel free to leave them in the comments section below.